I arrived home about 5 minutes before San Diego lost power at about 3:40 pm PST. Thankfully, the blackout only lasted 10 to 12 hours. I went to bed at about 10:00 pm with the expectation that power still might not be restored in the morning because SDGE had warned that it could take 24 hours or longer to restore power. I was pleasantly surprised to find that the gird was back up by the time I woke up at about 5:00 am. 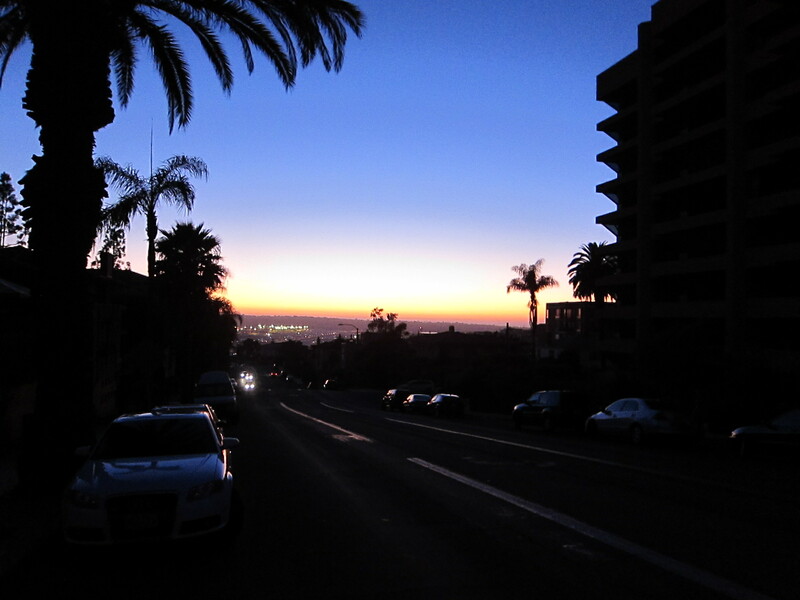 I took the picture above on Laurel Avenue, facing west, toward San Diego’s major airport, Lindbergh Field. The runway lights remained on at Lindbergh, but operations came to a halt because the terminals lost power and the TSA could not properly screen passengers. Before I called it night I took a walk around some of the neighborhoods surrounding my building on Cortez Hill, including Bankers Hill and the Gaslamp. The people that I encountered in those neighborhood handled the situation with complete calm. Most of the bars in the Gaslamp closed, but a few remained open, operating by candlelight, and they were packed in some cases. It was reassuring to see several San Diego PD cars stationed in the Gaslamp. As I noted earlier, I did not see any signs of unrest, but it was good to see San Diego PD officers on patrol. The blackout gave me a chance to assess how well prepared I was for a catastrophic event such as a massive earthquake or large scale terrorist attack that would cause a loss of power and/or water for several days. I had enough bottled water to last for several days. Good to go there. My food stocks were a little low. I think I am going to buy some MRE’s. I purchased 12 MRE’s back when I lived in Manhattan, in the aftermath of 9-11, but I never replenished my supply when I moved out to San Diego. Time to purchase some new MRE’s. I used my battery-operated Radio Shack emergency radio for the first time. I’m glad I bought that item. It finally came in handy. It has a hand crank for recharging and is also equipped with a built in flashlight. I had a Mag Light flashlight, a AA Krill Light and a portable lantern ready to go, as well as back-up batteries. I used all three items. I will probably order at least one more Krill Light. Fortunately, my iPhone was fully charged at the time the power went out, but my iPad only had a 40% charge, although I was able to boost the charge to 63% by plugging it into my MacBook, which I totally drained. I didn’t mind doing that because my iPad is 3G equipped and my MacBook is not. The iPad proved to be a valuable tool for keeping updated on the latest developments, especially via Twitter. SDGE, to their credit, used Twitter to keep the public informed. Another lesson I learned from this event is that I should have an external battery capable of recharging my iPhone and iPad. There are several good ones out there and I plan to order one soon.